The oboe looks very similar to the clarinet, but sounds very different! Most of the oboes are made of wood, and their sound is produced by blowing air through a thin double reed at the upper end of the instrument. The strong sound of the oboe is easy to pick out even when many of the orchestra's instruments are playing. The oboe plays the tuning note at the beginning of orchestra rehearsals and concerts. Another double-reed instrument, often played by an oboist in the orchestra, is called the English horn. The English horn has a very confusing name. It is neither English nor a horn. What a mystery! It plays a little lower than the oboe, has a pear-shaped bell, and sounds wonderful in slow, thoughtful solos. When playing, we hold the instrument out from our body, and blows through the double reed at the upper end. The oboe is very difficult to play, because we must force air at very high pressure into the tiny double reed. The high pressure of the air as it is sent through the reed helps to create the oboe's unique, focused tone. The oboe and the English horn are often used to play sad or emotional melodies, but they can sound playful, too. One of the most difficult parts of playing them is making the reeds, makes your own so that they exactly match your instrument and your way of playing. The oboe was invented in the 17th century by Jean Hotteterre and Michel Philidor, two French musicians. They modified the louder shawm into a new instrument, the hautbois. The hautbois had a narrower body than the shawm and was split into three sections. By the 18th century most orchestras had incoporated oboes into the ensemble. Throuhgout history, several copmosers have written solo pieces for the oboe. These composers include George Frideric Handel, Joseph Haydn, Wolfgang Amadeus Motzart, and Ludwig van Beethoven. Prototypes of the English Horn appeared before the end of the 17th century. These instruments were curved and leather covered with holes in the body. The holes were usually bored at an angle to accomodate the stretch of the fingers. It is believed that the oboe da caccia (hunting oboe) which was used by Johann Sebastian Bach was almost identical to the English Horn. Its distinctively dark and plaintive tone has been featured by such composers as Hector Berlioz, Peter Ilich Tchaikovsky, and Richard Wagner. The oboe was invented in the 17th century by Jean Hotteterre and Michel Philidor. The range of the modern oboe extends two and a half octaves from the B below middle C. Oboes are found in a variety of forms throughout the world. Find the major parts of the oboe in this picture. The reed is made from a piece of cane attached to a metal tube called a staple. To make a double reed, first a strip of cane is cut, folded over, and tied onto the staple with twine. The end is sliced off, leaving an open slit. The upper end of the reed is carefully scraped away with a knife until the two "blades" vibrate freely when you blow. The oboe has a complex arrangement of metal keywork that makes the instrument surprisingly heavy to hold. The keys cover holes in the body of the oboe, and make it possible to create different pitches. 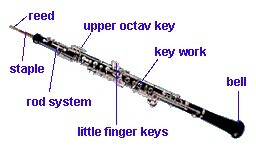 The upper octave key controls the highest of the oboe's high notes. It is operated by the side of the left index finger. Keys operated by the little fingers are very important on woodwind instruments. Pressing down on any of the little finger keys will open or close a hole further down the instrument which the hands can't reach. Professional oboe and English horn players spend many hours making their own reeds and reeds for their students. The cane comes from France and looks like bamboo, only it's stronger. You can see in this picture of the English horn that even though it looks similar to the oboe, its reed end is angled and its bell is pear-shaped. It's also lower in pitch than the oboe, and a few inches longer. Why is it called the English horn? Nobody really knows, but here's one theory. The predecessor of the English horn is the oboe da caccia [say dah KAH-chah]. That's Italian for "hunting oboe." Perhaps the horn part of its name comes from the idea of the hunt or hunting horns. Maybe early on, the name horn was used interchangeably for any instrument used during a fox hunt. (Do you have a better guess?) Now about the English part. The early instruments were made in a bent shape, or angle. Today this part is the metal bocal, which is angled towards the players mouth and holds the reed and staple in place. One theory has it that the French word "angle" was mistranslated as "anglais" which is the French word for "English."